Flirtin is a new to me brand, and I'm excited to share it with you! 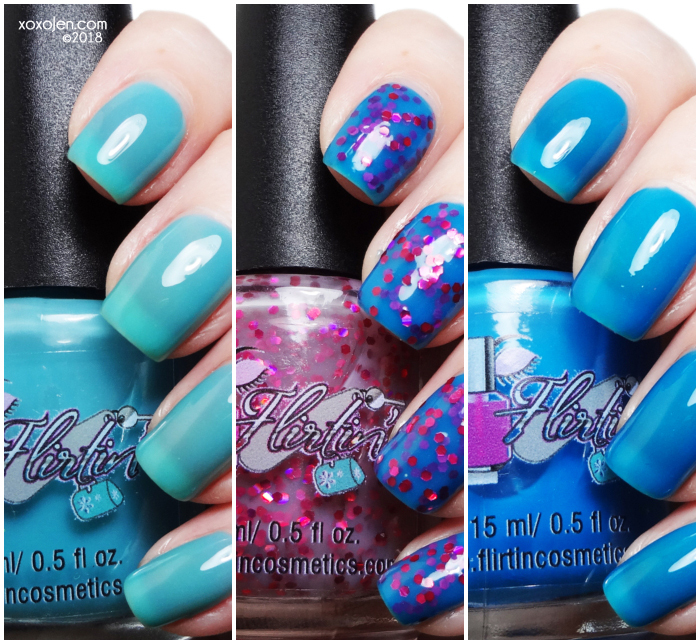 I was sent the Summer Beach or Block Party collection, which is a trio of fun shades! The polishes are are 5-Free and go great together! In addition, you can receive 15% off with code JenParty18 at Flirtin' Cosmetics - available now! This is a Maui blue crelly polish, shown is two coats with topcoat. An aqua crelly polish, shown in 3 coats with topcoat. a pastel pink jelly is filled with large bright pink glitters, shown in a jelly sandwich with Ice-cream Cone or Blue Raspberry Italian Ice. The pink in the base is noticeable in the bottle but I didn't notice the color at all when doing my jelly sandwich so it can definitely be layered in without changing your base shade. I enjoyed swatching these, and creating the sandwich look with the glitter. The color combination of this set go great together. The formula was fantastic, non-streaky and easy to apply. You can receive 15% off with code JenParty18 at Flirtin' Cosmetics - available now!